How to book Freedom251 easily? If anyone wants to book the freedom 251 mobile phone please follow the steps below to do all the typo works like filling address, filling quantity, clicking the submit button etc., automatically till we get the payment page. You no need to reload and type details every time. Till it get success the browser will try again and again automatically. Install any js addon/extensions to your browser. As I am using chrome I added cjs. It is 100% free. Once installed you can see the icon on the tool bar as below. Go to www.freedom251.com site and then click the cjs icon as below. You will get a window like below. Copy the below code and paste in it. In the code, update the values like address, quantity, mail address etc., as per your need. Once you have updated just save it. That’s it. The browser will reload the page automatically multiple times till it able to reach the payment page. You can continue with your other works. When any page other than the cart page opened it will alert you. By that time if the CCAvenue page is properly loaded continue to the payment. 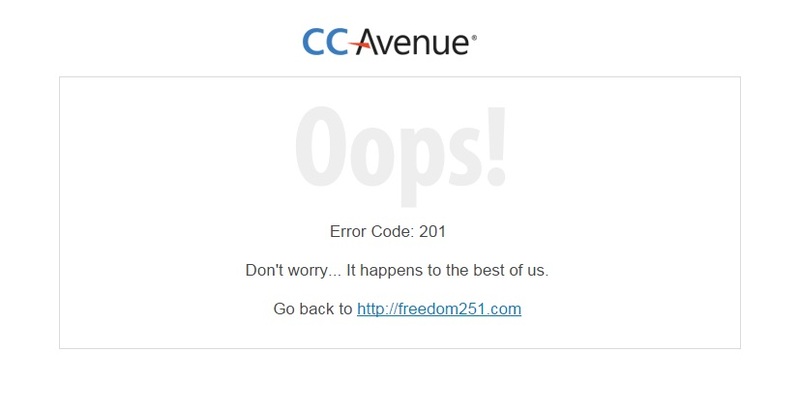 If it shows any other error like below screen please reload the cart page (http://freedom251.com/index.php/cart). Based on the above method I was able to book. If you face any issues please comment below or mail me at rajeshmepco@gmail.com. I will help.